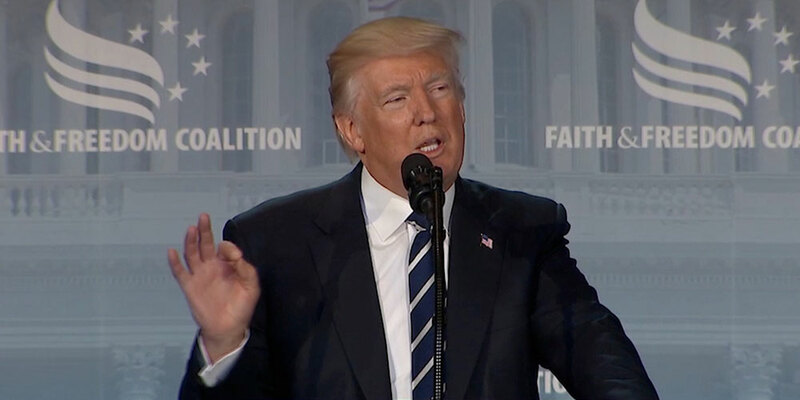 Yesterday, while former FBI director James Comey was calling U.S. President Donald Trump a liar, Trump was speaking at the Faith and Freedom Coalition national conference, an evangelical Christian event filled with anti-LGBTQ speakers. We listened to his speech and pulled out all the important bits so you don’t have to. He later referred to Democrats repeatedly as obstructionists. “I believe that people who come to our country should love our citizens and embrace our values. Our values,” Trump said. Throughout his campaign, Trump infamously touted his immigration policy as a way to get rid of Mexican drug dealers and rapists coming over the border and talked about getting tough on crime in the inner cities, a way of backing police practices that primarily target people of color. 3. Appointing an anti-LGBTQ Supreme Court Justice? Trump praised himself for appointing a Supreme Court Justice Neil Gorsuch, “in the mold of the late, great Antonin Scalia” (the deceased Supreme Court justice who sided with very anti-LGBTQ positions on court cases). While Gorsuch himself has said very little about LGBTQ rights, his previous record and statements raise serious concerns that he might rule against expanding queer rights under the U.S. Constitution. Considering that 81% of evangelical voters voted for Trump, it makes sense that he would mention the religious liberty executive order he signed in early May. The executive order he’s referring to accomplished virtually nothing apart from emboldening religious groups to pursue discriminatory actions in the public sphere. However, this claim is slightly absurd because churches have openly flouted the Johnson Amendment for decades without any governmental repercussions. He didn’t mention any specific plans to put religion back in schools, but considering that his Secretary of Education Betsy DeVos is okay with federally funded schools discriminating against LGBTQ students, perhaps that’s part of his idea. 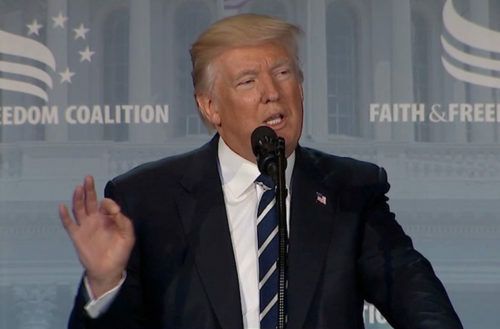 During his speech, Trump also honored Dr. James Dobson — a fellow speaker at the conference and founder of the anti-LGBTQ hate group, Focus on the Family, who has said that gay rights will destroy Christianity and America. He mentioned Dobson by name, asked him to stand up and mentioned his lifetime achievement award to be bestowed later in the conference. A section of Trump’s speech celebrated the “death spiral” of the Affordable Health Care Act (aka. Obamacare) and the passage of the Affordable Health Care Act (aka. 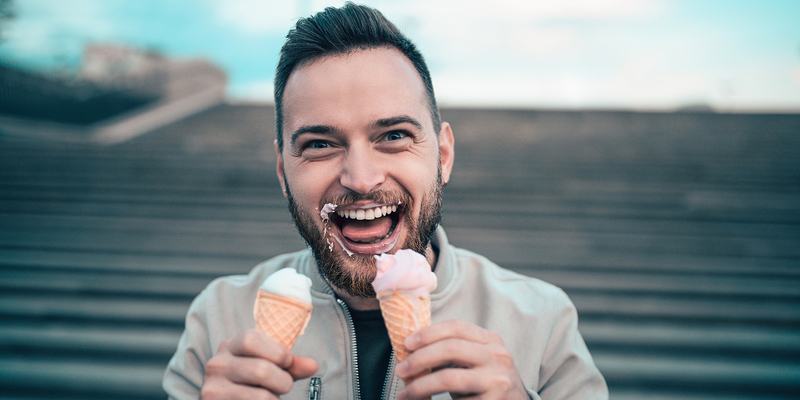 Trumpcare) in the U.S. House, even though it will slash Medicaid, increase costs for nearly 130 million Americans with pre-existing conditions and leave millions uninsured, including LGBTQ people and people living with HIV. He later said, “We cannot allow radical Islamic terrorism to spread in our country or allow extremists to find sanctuary on our shores,” an apparent nod to his Muslim travel ban which is currently held up in courts. This line is interesting insofar as his campaign promise “to protect our LGBTQ citizens from the violence and oppression of the hateful, foreign ideology.” It’s important to note that Muslims are those harmed most by such terrorist groups and that no legal refugee in the U.S. has ever carried out a terrorist attack since 1980 (and even before then, the attacks were carried out by Cubans, not Middle Easterners or Muslims).